Touchscreen PCs aren’t new, but the latest batch of all-in-ones delivers a whole new level of functionality, thanks to new screen technologies and Windows 7’s ability to support them. The new capacitve screens let you zip through menus with the barest of touches, like the iPhone. Plus they support multi-touch, which allows you to use more than one finger for gestures, such pinch to zoom (for getting a better look at that vacation photo) or using multi-fingered swipes to scroll (great for getting to the bottom of that "dinner party" playlist in a hurry). 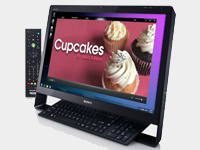 Touch is perfect for quickly showing off photos and videos or looking up recipe information (virtually all the PCs come with special recipe book software)—tasks that you might do while milling about or that are quick enough that sitting down in front of the PC seems like a waste of time. And for other day-to-day tasks like replying to email, heavy Web browsing or using Office, you can always use the keyboard and mouse. With touchscreen PCs, the computer itself mounts behind the screen, within the same housing, and the speakers are usually built-in. And with a wireless keyboard and mouse and Wi-Fi, the only cable you’ll need is the power cord, making all-in-ones perfect for the kitchen or great room. While pricier than some, this 24-inch, 1080p, widescreen multi-touch PC comes packed with Blu-ray, 4GB of memory and a discrete NVIDIA graphics card for pushing pixels to its large Full HD display. There is even an option for a TV tuner, so you can use it to replace that aging CRT TV in your bedroom or kitchen. The TouchSmart line actually consists of three different PCs, the low-end AMD powered 300z, the mid range Intel-packing 600t ($1,049), and the high-end 600xt ($1,349). The 300z comes with 2 GB of memory and a 20-inch HD screen, while the 600t bumps the RAM up to 4GB and the screen to 23 inches. The 600xt adds a discrete graphics card from NVIDIA. 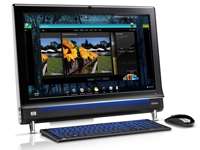 HP has been making touch-screen desktops longer than most, and it shows in the software. 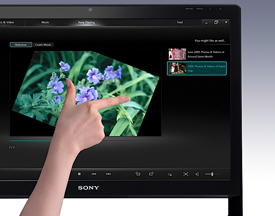 Their custom-built touch interface is much more polished than its competitors. The Gateway One comes in 20-inch and 23-inch models. 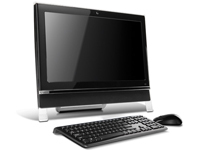 At the upper end, the 23-inch ZX6810 ($1,399) crams in a quad core processor, a 1TB hard drive for data (plus a 64GB solid state drive for running Windows 7), 8GB of memory, a discrete graphics card from ATI with 1 GB of memory, an HD Web cam, and a TV tuner card—making it an incredible value, despite the high price tag. The entry-level 20-inch model won’t disappoint, with its Pentium Dual-Core processor and 3GB of memory.